Copyright 2017-2018 - ATTORNEY ADVERTISING - Choudhry & Franzoni, PLLC. 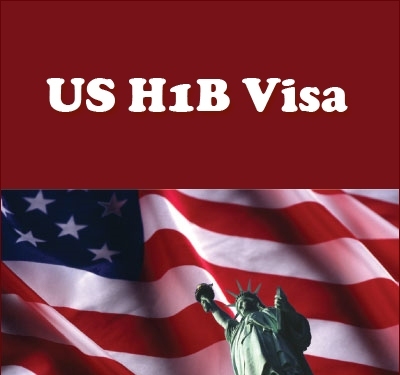 The H-1B visa is a non-immigrant visa that allows U.S. companies to employ foreign workers in specialty occupations that require theoretical or technical expertise in specialized fields such as in IT, finance, accounting, architecture, engineering, mathematics, science, medicine, etc. Individuals cannot apply directly for an H-1B visa. Instead the employer must petition for entry of the employee. If a foreign worker in H-1B status quits or is dismissed from the sponsoring employer, the worker must either apply for and be granted a change of status to another non-immigrant status, find another employer (subject to application for adjustment of status and/or change of visa), or leave the U.S.
H-1B visas are subject to an annual visa cap each financial year. US employers can begin applying for the H-1B visa six months before the actual start date of the visa. Employers can apply as soon as April 2, 2017 for the 2018 cap, but the beneficiary cannot start work until October 1, 2017. Current immigration law allows for a total of 85,000 new H-1B visas to be made available each government fiscal year. This number includes 65,000 new H-1B visas available for overseas workers in specialty (professional) level occupations with at least a bachelor’s degree, with an additional 20,000 visas available for those specialty workers with an advanced degree from a US academic institution. In recent years the H-1B visa cap has been heavily oversubscribed near the beginning of April each year. USCIS then holds a lottery for the available H-1B visas available. According to an interim rule announced on March 19, 2008, employers may not file multiple or duplicative H-1B petitions for the same employee. To ensure fair and orderly distribution of available H-1B visas, USCIS will deny or revoke multiple or duplicative petitions filed by an employer for the same H-1B worker and will not refund the filing fees. A bachelor’s degree or higher degree or its equivalent is normally the minimum requirement for the particular position. The degree requirement is common for this position in the industry, or the job is so complex or unique that it can only be performed by someone with at least a bachelor’s degree in a field related to the position. The employer normally requires a degree or its equivalent for the position; or The nature of the specific duties is so specialized and complex that the knowledge required to perform the duties is usually associated with the attainment of a bachelor’s or higher degree. Having education, specialized training, and/or progressively responsible experience that is equivalent to the completion of a U.S. bachelor’s or higher degree in the specialty occupation, and having recognition of expertise in the specialty. Through progressively responsible positions directly related to the specialty. In general, 3 years of work experience or training in the field is considered as equivalent to 1 year of college. At Choudhry &Franzoni Law Firm our attorneys we represent companies across United States in all filling H-1B Applications.At Choudhry &Franzoni Law Firm Business Immigration Lawyers are highly skilled in assisting companies with managing the complex and evolving immigration process of obtaining temporary and permanent work authorization in the United States. A hallmark of our practice is creating an integrated immigration process for organizations with a multinational workforce. Law Firm of Choudhry &Franzoni, PLLC has qualified H-1B Visa Application Lawyers. A consultation with a qualified -1B Visa Application Attorney is only a phone call away, Call Us Now at 212-529-8000. We aim to lead in each practice and area of law we work in. Coming from in-depth understanding of the law and the industry, capitalizing on extensive experience, we provide hands-on advice that speaks the language of our client’s business. Whether in Business, Real-estate, Matrimony, Immigration or Personal Injury Law. 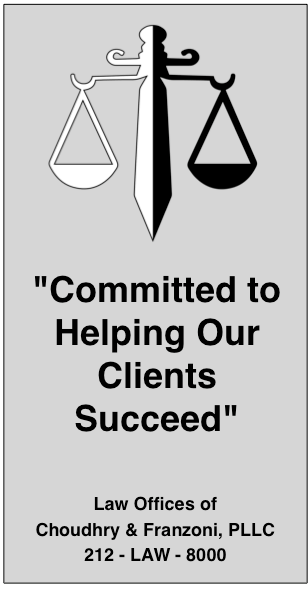 We are committed to help our clients succeed.